This post is sponsored by RockABye. All opinions and pictures are my own. As a child, I received an adorable rocking horse from my nurse Lauren. My Mom still talks about how I would love to ride it for hours on end just laughing,singing and pretending I was on my very own horse. 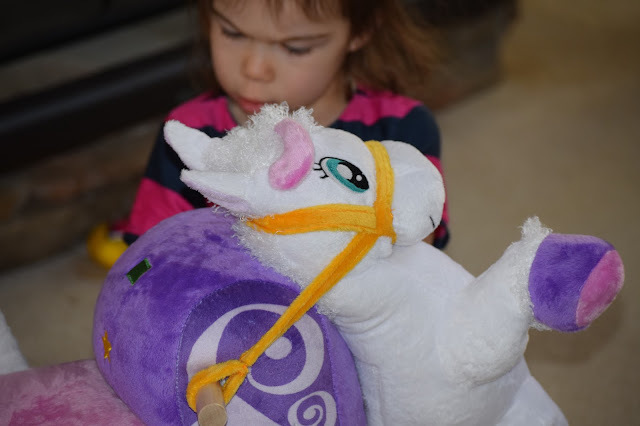 In fact, we kept it and Lily loves to ride it herself, although because it's 30 years old, I'm a bit hesitant at times because it's so sentimental to me. My daughter is obsessed with all things princess. Of course she has her moment's where she wants to be a tomboy; running and jumping in mud and puddles and wrestling with her Dad, but then she'll want to wear a princess gown, plastic high heels and pretend she's going to a beautiful ball. I don't blame her! I enjoy getting dressed up too but sadly can't find a princess carriage to take me to my own ball. 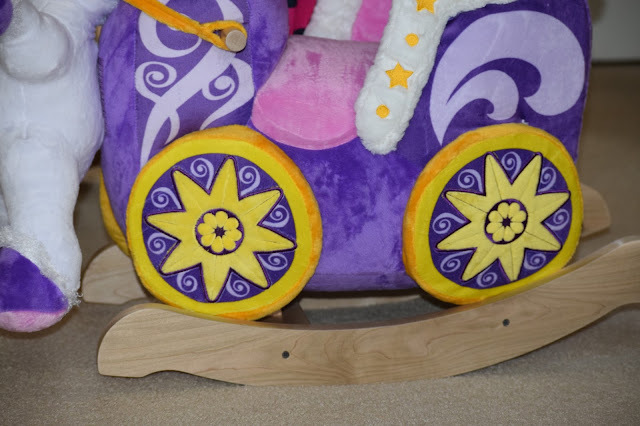 When I saw this adorable Princess Carriage rocker from RockABye I knew that Lily would probably pass out from excitement. If you saw on my Snapchat a few weeks ago when we opened it, she was squealing and screaming at her new rocking horse. Now you may be thinking why a three year old needs a rocking horse and my answer is, who wouldn't want one?! This particular rocker has everything you can think of! 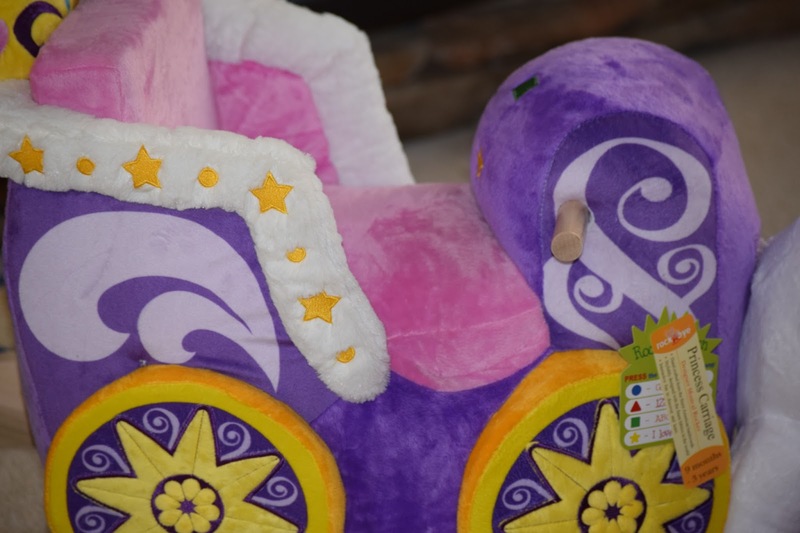 Located on the front of the carriage, you'll find 4 buttons that activate original songs such as ABC's, 1-10, colors, shapes and more! 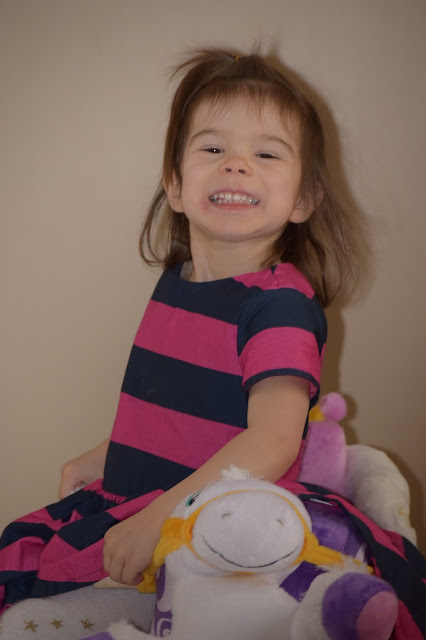 Lily already knows her original ABC's tune but she loved singing along to the new version as she rode to her party. 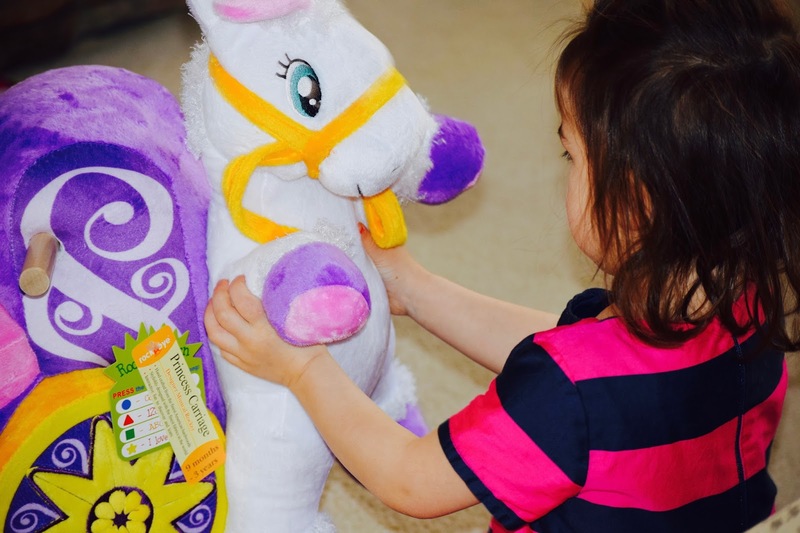 Her favorite part is the unicorn that's Velcro onto the front because she can take it off to bed with her after her imagination has taken her to her kingdom. The carriage is made from extremely hardwood board which is built into the back of the seat and secured to the rocker base. This helps support my little girl's back and make it seem more like a chair to sit on rather then a hard surface. Likewise to Lily's rocker, I of course needed to get one for the new little man arriving in a few weeks. 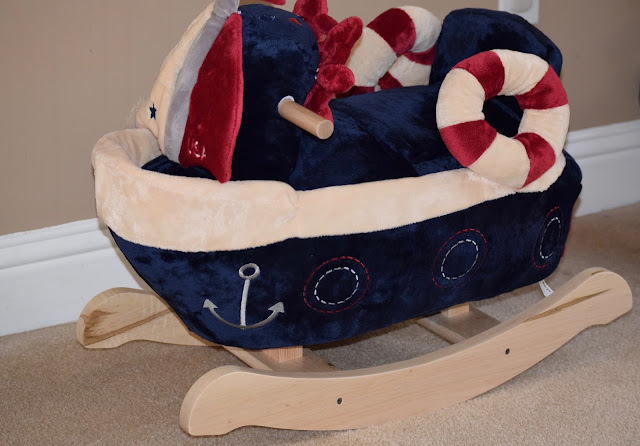 His nursery is a navy, white and grey theme and I thought this American Sailboat would be the perfect touch for his room. 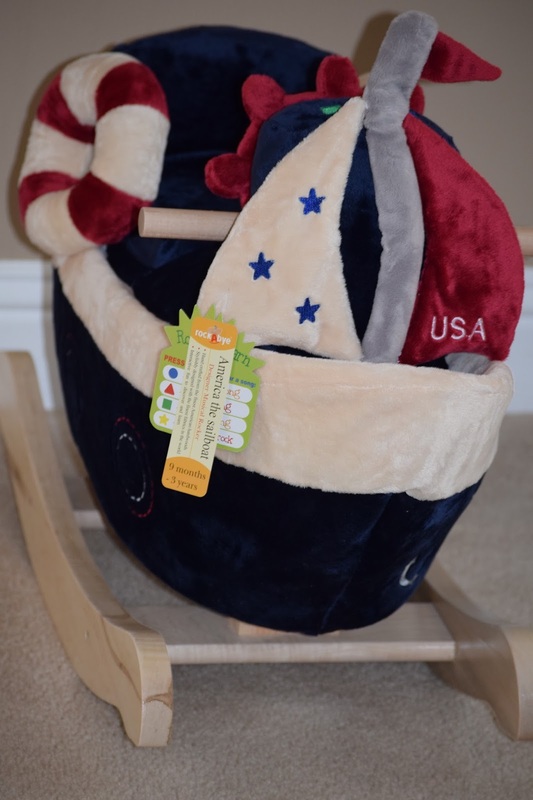 I love the red, white and blue theme that it has especially the cute sturdy padded seat created from North American maple wood. The handles are also from the same base and the fabric is extremely soft and plush. Similar to Lily's rocking chair, the steering column has various shapes with the same songs. We loved exploring the surprise squeakers! 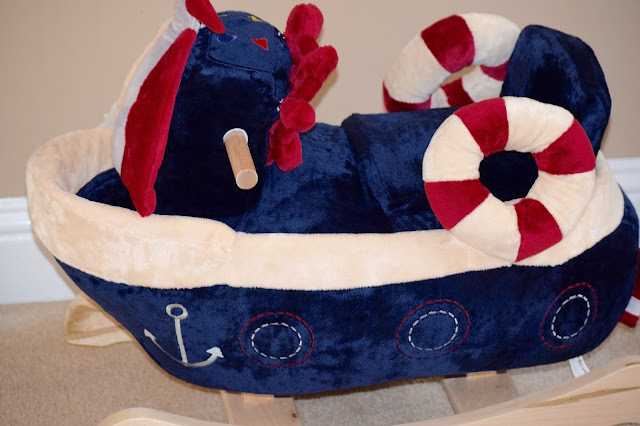 I know our little man will adore it when he gets older! Does your little one need a rocking horse that fits his/her style? There are so many various rockers to choose from like this adorable butterfly, dragon , and airplane. Grab your favorites today and know that your child is never too old to rock! Those are adorable! Love the sailboat. Aww so adorable, so happy for you and your children. It's the little things that brings a life time of happiness 😊.